It’s been a few weeks now since I made it back from a winter trip to Sable… but first here’s a little catchup on our August trip in 2013. Continuing with her Master’s thesis work, Zoe was anxious to get back to Sable and resume her tracking of Ipswich Sparrows. She’s studying the timing and routes of Ipswich migrations from the island to the mainland. Our goal this trip was to deploy 64 miniature radio-tags, half on adult sparrows and the others on juveniles, to compare the migration strategies between experienced and first time migrants. Same drill as last year but this time more automated receiver towers are scattered along the Nova Scotia coastline and the Gulf of Maine so we can better track their movements. 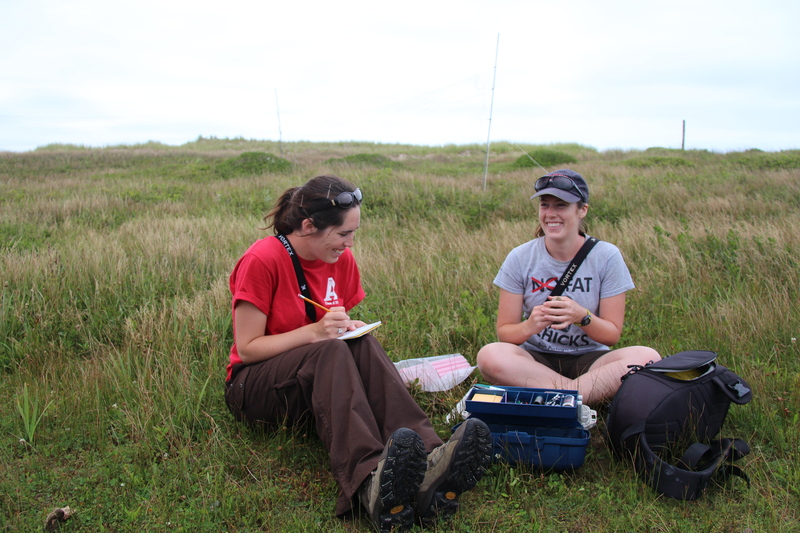 Holly takes notes while Zoe measures, bands and deploys a radio tag on an Ipswich Sparrow. A group of horses wandered by during the middle of a sparrow tagging session. Over the past two years, Zoe has become a master at catching, tagging and banding Ipswich Sparrows. That means it’s my turn to be the assistant so I stay out of the way and do what I’m told! We also brought Holly, her first trip to Sable, and Sarah, a veteran of winter trips but her first summer visit to the island. She was pleased to see that winter balaclavas are replaced with tank tops during summers on Sable. Sometimes while catching sparrows our mist-nets catch other birds. Side-by-side with an juvenile Ipswich is a female Yellow Warbler. During August and September Sable acts like a big net “catching” many species of migrant song birds. 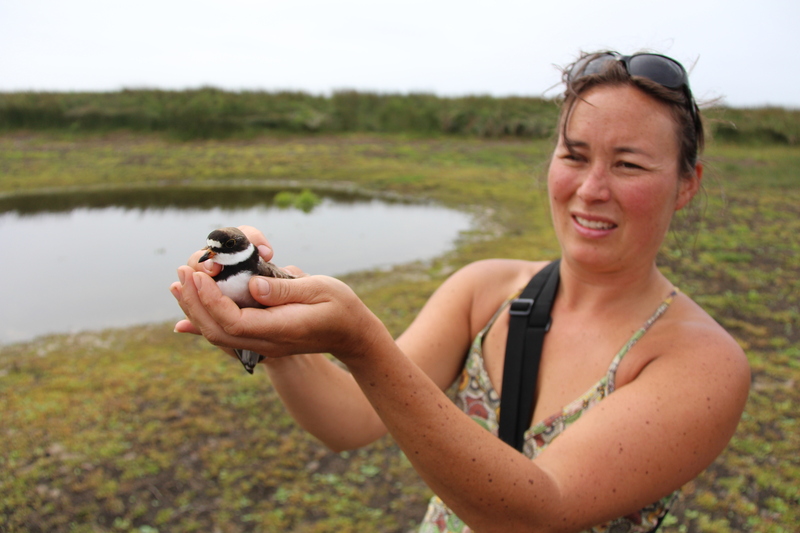 Sarah releasing a Semipalmated Plover after it was caught in our mist-nets. 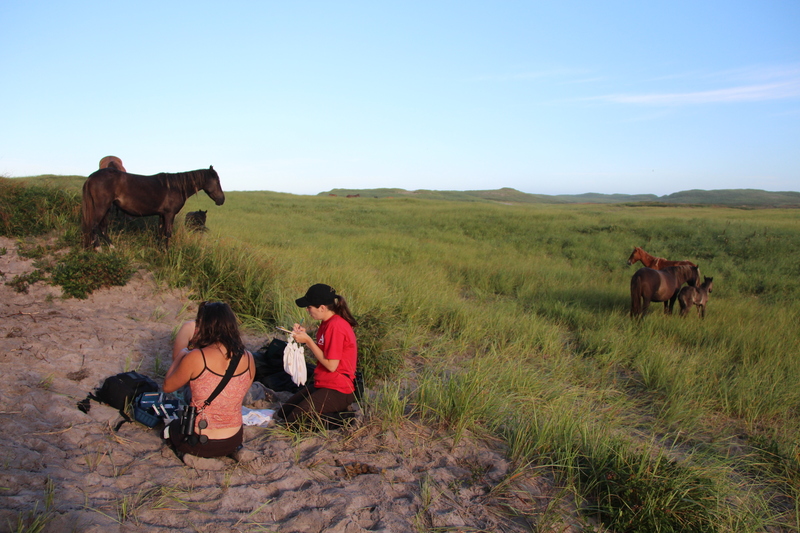 Just another day at the office on Sable Island. 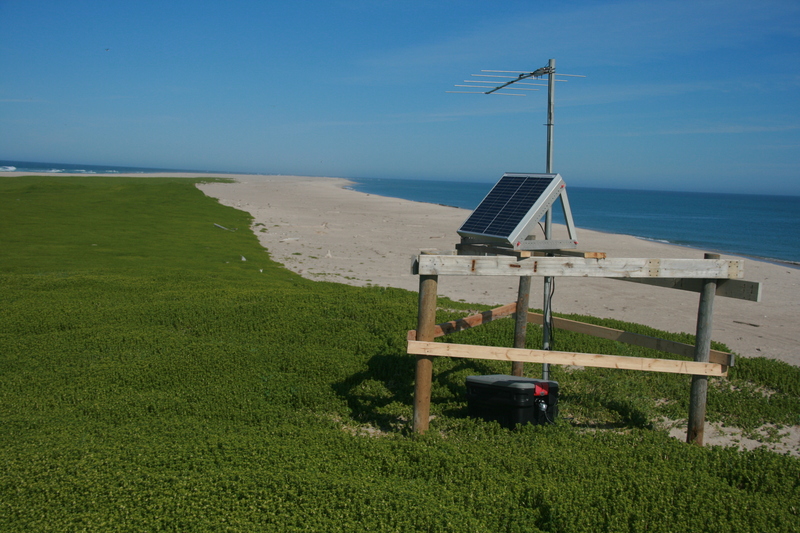 We checked on our automated receiver stations, deployed some radio-tags on Great Black-backed Gulls, and counted terns at the tips of the island. Oh, and of course we deployed all our Ipswich radio-tags…well all but one which wouldn’t turn on. Since the installation of this radio-tag receiver station in June, the horses have been using our rig as a scratching post. The buggers even snapped some of our cables. 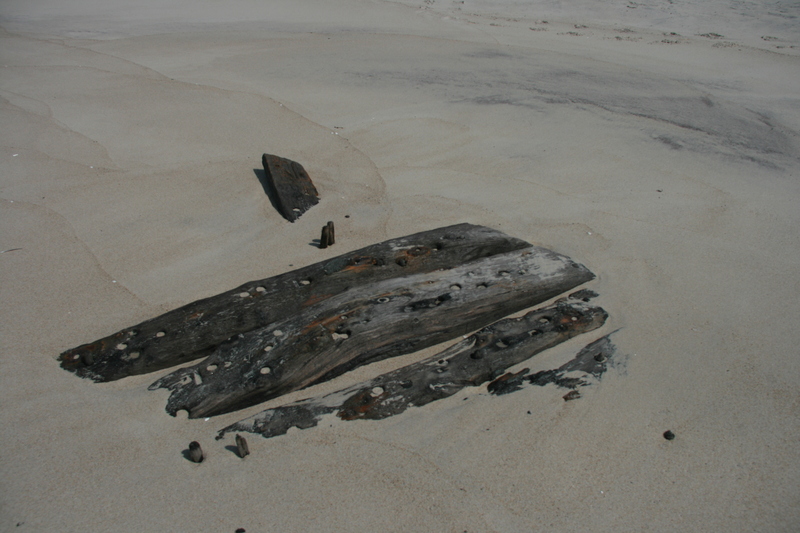 Repaired in August, this station recorded the departures of Ipswich leaving the island through the fall. As always the trip was fun and awe inspiring, but this time a little bitter sweet too. Since our project is wrapping up this year, this was our last major field trip to tag birds on the island. Now it’s time to sit at the computers all winter crunching numbers and writing up results. In time I’ll start posting some results of our work on this blog so stay tuned. And there’s always hope for some follow-up studies that might bring us back here next year! In the mean time, here are a few more of my favourite pictures from the summer season. 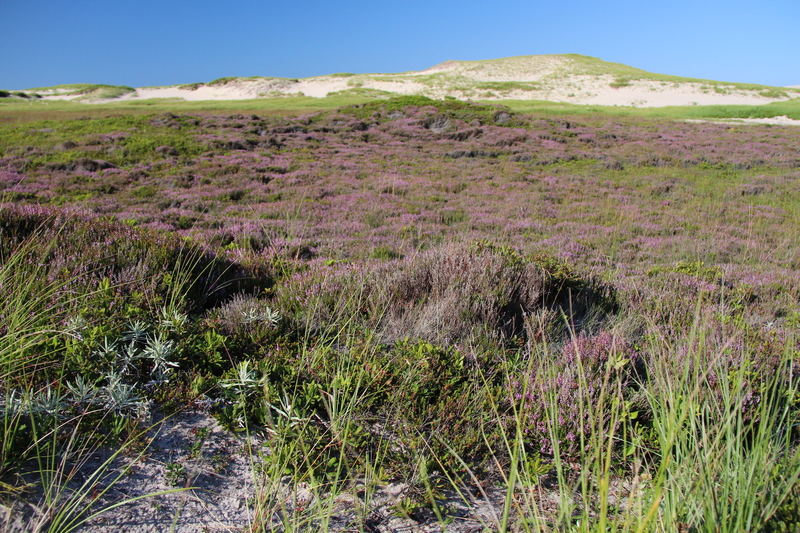 Heath vegetation covers only 10% of Sable but creates amazing habitat for birds and a nice purple hew when in bloom. 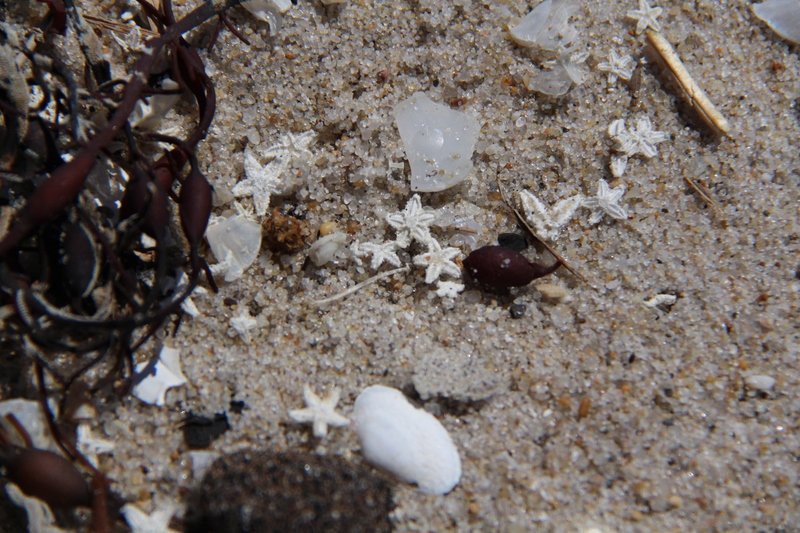 One day in August the south beach surf line was littered with tiny little sea stars smaller than dimes. 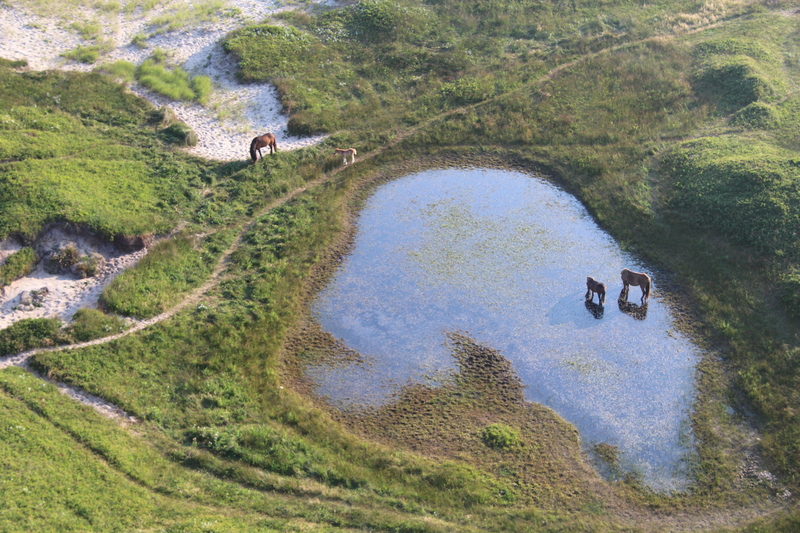 Aerial view of some horses drinking form the freshwater ponds. Horse trails criss-cross the island along their favourite routes. Horses drinking from the ocean? Apparently when they’re thirsty enough, Sable horses will even drink from the “big pond”. Maybe this makes up for a lack of salt licks. 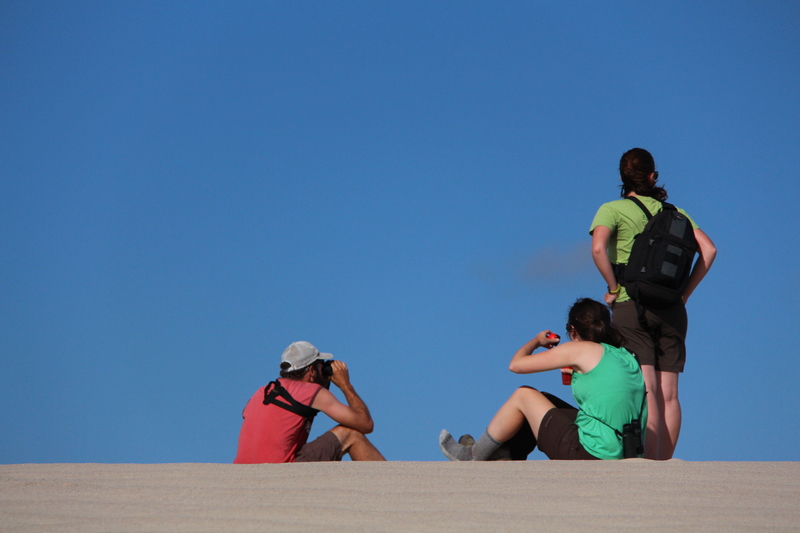 The crew takes a break at the top of bald dune. 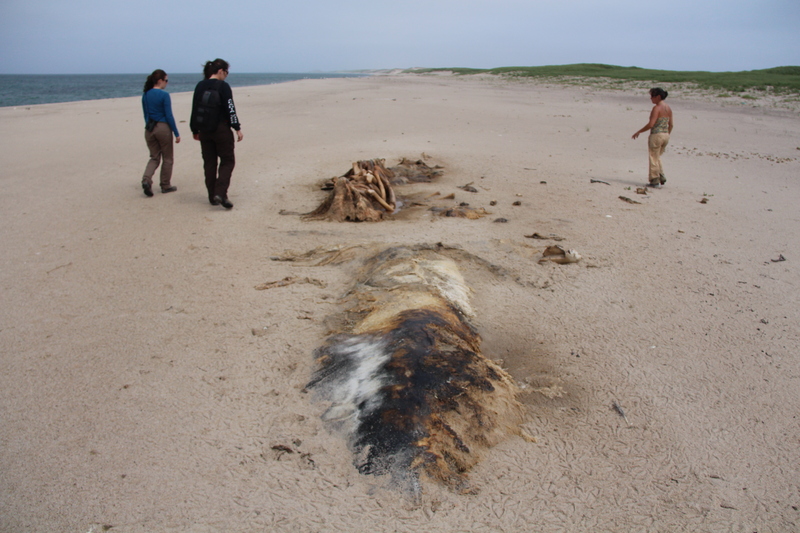 A sperm whale washed up last winter is still working through the stages of decomposition. Now just some rotting flesh near the head and a pile of bones towards the tail. Check out last winter’s photos to see how much has changed in 8 months. Yikes! What happened to the spring…and summer. I last posted on this blog back in May when we were eagerly awaiting our flight to Sable to begin our spring fieldwork. With good intentions I have been meaning to write several posts since then but the summer field season slipped away, and, well…here we are in December. The new year is almost here so this is my last chance to redeem myself and make a post in 2013. I can barely remember what I ate for dinner last night so remembering all our Sable adventures over the summer will be a hard one for me. So here is a quick recap of our spring trip with lots of photos to share some highlights and jog my memory. 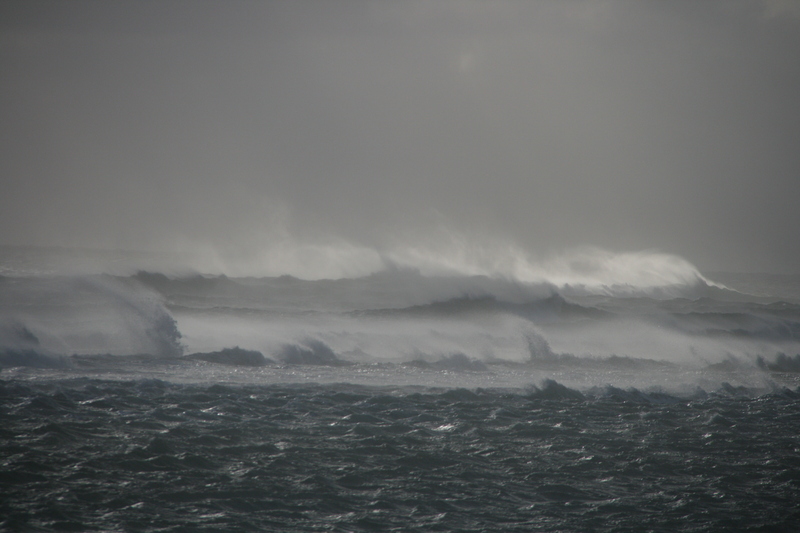 Heavy rains in the spring caused some flooding at the Sable Island “airport” which delayed our arrival by 6 days. Finally the water receded from the beach leaving a narrow landing strip for the charter plane to touch down between the dunes and some still flooded sand flats. 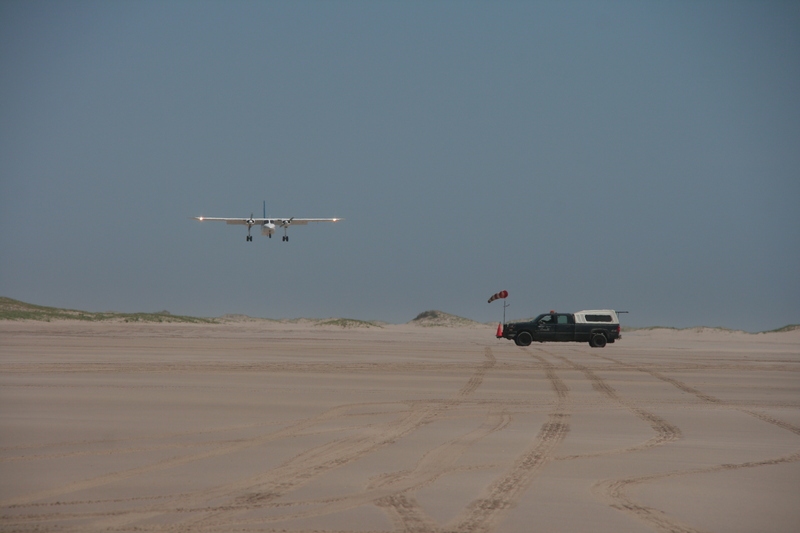 May 21…the new bird team had arrived with returning grad students Jess and Zoe, newbie Dani (with a huge grin on her face as she stepped out of the plane onto the Sable sands for the first time), and myself, Rob. 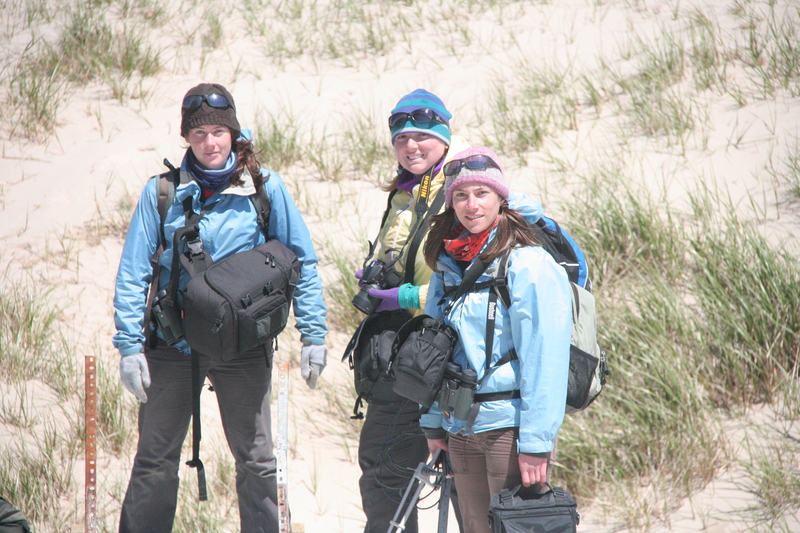 Acadia University bird research team on Sable, May/June 2013. Jess, Dani, Zoe, and Rob around a whale skull. Already behind schedule, we quickly got to work with the first task of catching gulls. 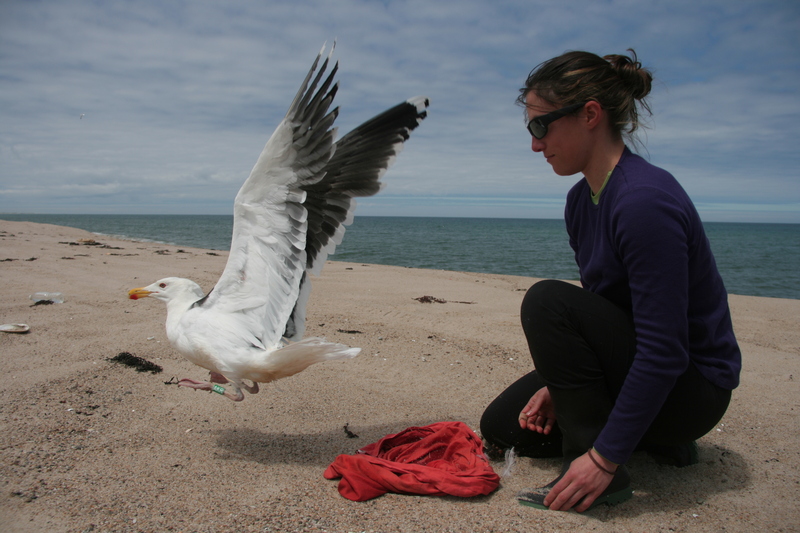 As with previous years our goal with the gulls was to catch and deploy. 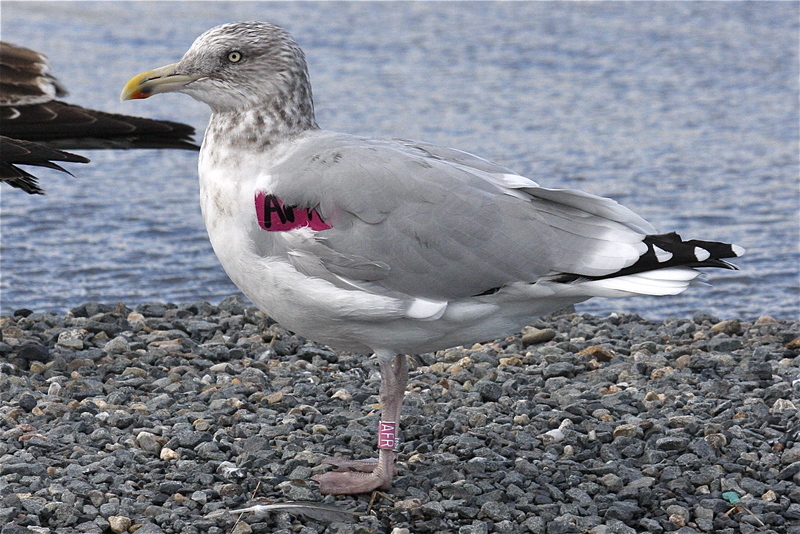 Having put out enough wing-tags for our studies in 2012, we are now deploying only VHF tags and satellite tags to track their movements electronically, but each bird still gets a colour leg-band each coded with a unique combination of three letters (like AFJ). For keen gull watchers out there we still want your reports of these colour bands and there are plenty of wing-tags still out there flying around since 2011 and 2012. Second mission for the spring trip was VHF tag deployments on terns at their two main colonies. A network of receivers around Sable and on offshore vessels is set up to monitor the comings and goings of terns from their colonies. 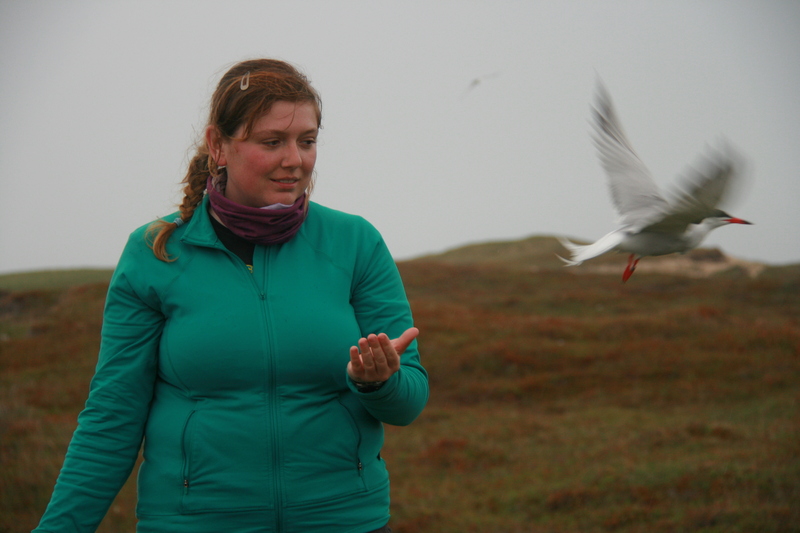 This is Jess’s project for her master’s of science degree with the goal of learning more about their foraging patterns and identifying important foraging areas around the island. Third mission was to track down VHF tagged Ipswich Sparrows. In April, as part of her master’s project, Zoe tagged 21 Ipswich sparrows on Conrad’s Beach on the mainland of Nova Scotia. A network of receiver towers deployed along Nova Scotia were set up to track their movements along the coast and their departure point for migration to Sable Island. During May and June, Zoe spent many days climbing and walking the dunes to track down these sparrows on Sable to confirm their safe arrival. Final mission was a to conduct another census of the gulls and terns to confirm our findings from last year and get better estimates of population size for the island. On Sable, gull nests are spread out all over the island making it near impossible to count nests directly, so gulls were censused by counting all visible adults that were standing in the dunes or flying overhead. Fortunately, the island is long and narrow with good vantage points…it was good exercise to climb to dune tops and ridges every 200 or 300 m of the island! The terns, on the other hand, were much more cosmopolitan and they nest primarily in two very large colonies at the east and west ends of the island. To census terns, we did counts in quadrats (e.g. 10 by 10 meter plots) to estimate nest densities which were multiplied over the total area of the colony. Census completed two years in a row now, we are working on a paper which summarizes the current population size and changes over time since surveys began in 1969. 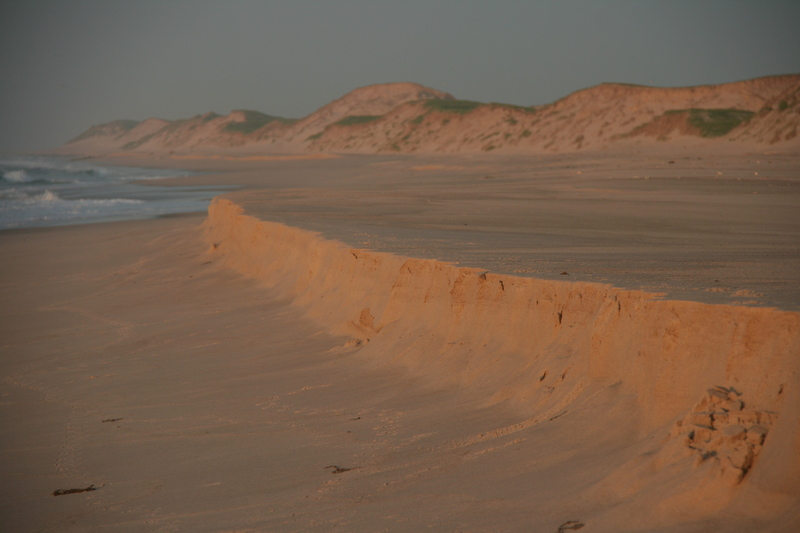 This information will help Parks Canada establish a base-line for future long-term monitoring of these populations on Sable Island. Okay, enough said about our spring trip and I promise to post again soon about our August trip to work with Ipswich Sparrows. My New Years resolution is to post more frequently. In the meantime I leave you with some random pictures of of Sable in the spring. Throughout this project I’ve had the privilege and the pleasure to visit Sable several times and during different seasons. We’ve been there in May and June for the spring nesting season of gulls and terns, in August to work with Ipswich sparrows before their fall migrations, and in January to download data from our tracking receivers. Each season seems to have its own mood and colours. White is the colour of winter with blowing snow, heaping seas and thousands of white coated seal pups. The spring skies are grey with seemingly perpetual fog when the warm(ish) air blankets the still cold ocean, but a little bit of green starts to poke out as the vegetation comes back to life. 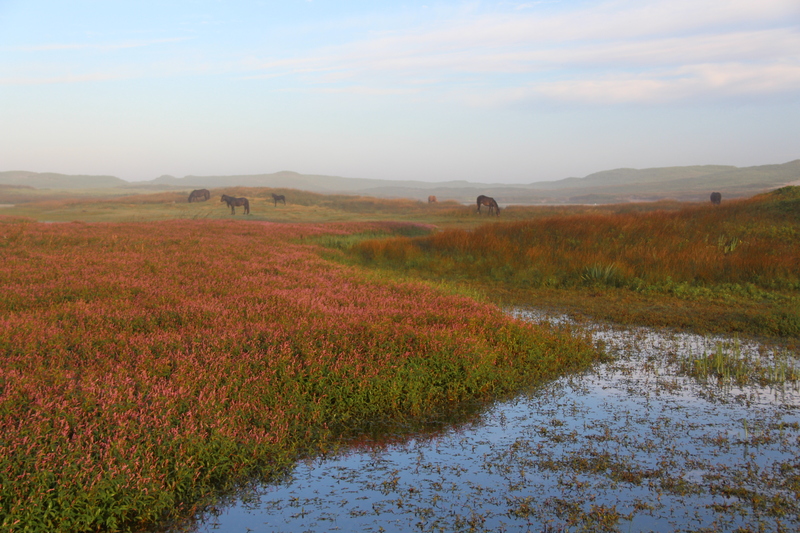 By mid summer Sable Island takes on its lush green grass, blue skies, and golden sand, speckled with flowers of yellow, purple and red. 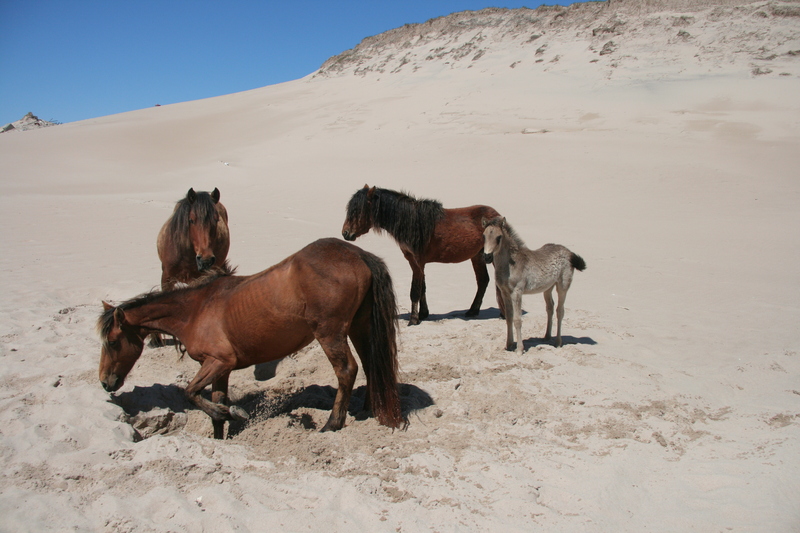 In preparation for upcoming fieldwork, this year we had a short trip to the island in late March which can only be described as brown; from east to west, winter has sucked the colour from all the vegetation which blankets the brown sand dunes, accented only by brown horses. 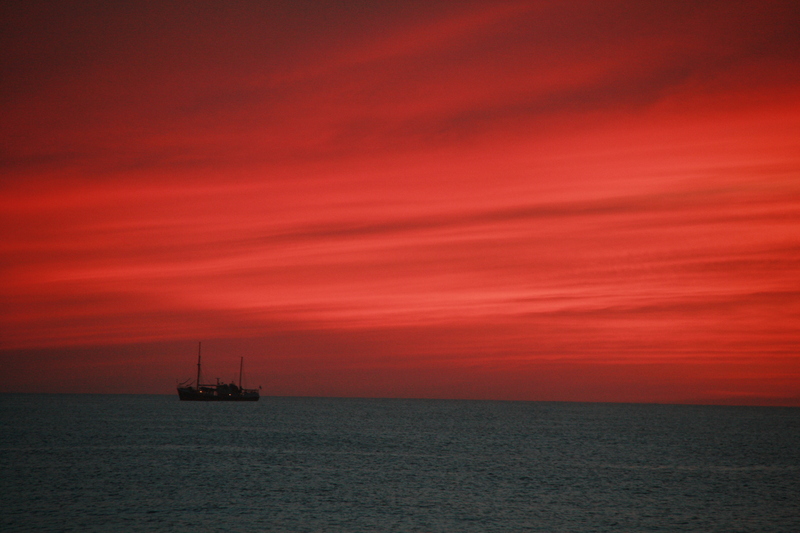 As harsh as this sounds, the island somehow retains its beauty through all its seasons and colours. 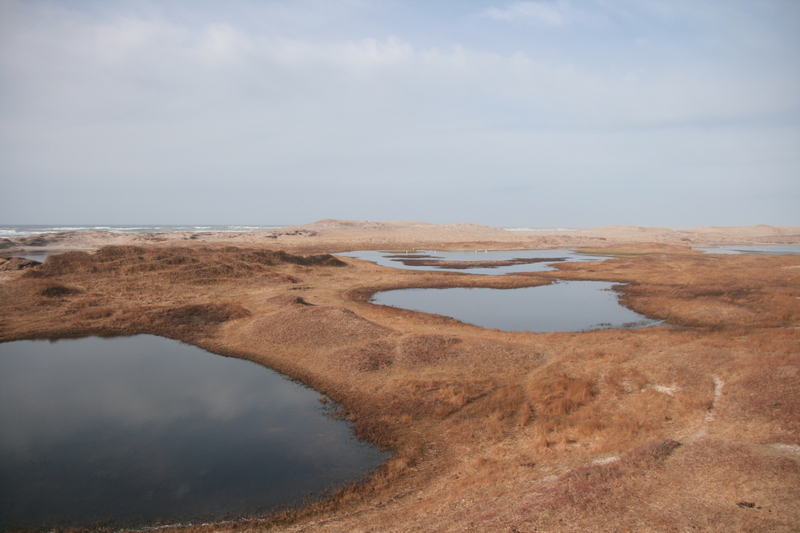 After winter storms of rain and snow, freshwater ponds on the island are full. 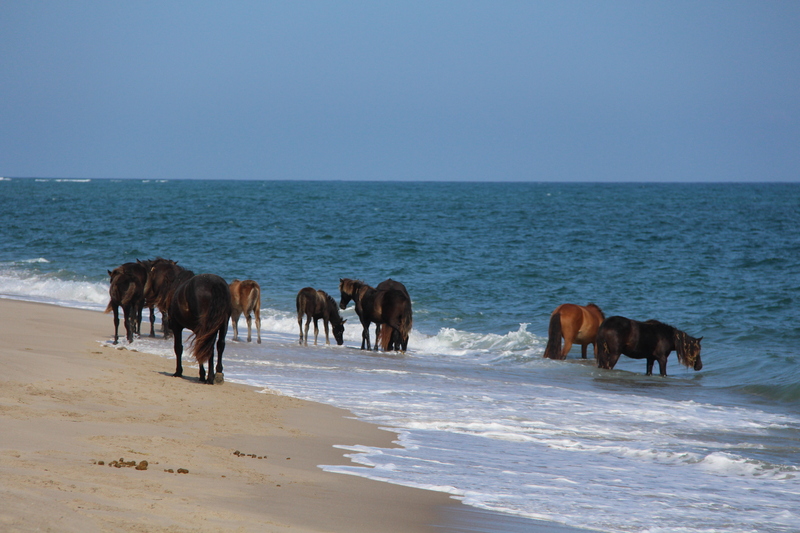 The horses are a constant but the other wildlife of Sable come and go with the seasons. 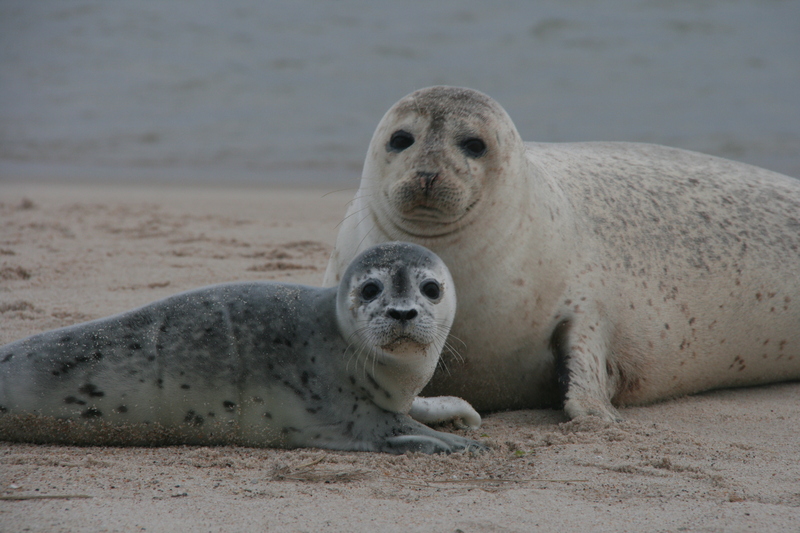 March is well past the pupping season for seals and too soon for breeding birds. But during our visit there were still plenty of gulls throughout the island. Some have probably been there all winter and others are returning in anticipation of their breeding season. Herring Gulls and Iceland Gulls were in the minority and Great Black-back Gulls rule the island at this time of year. Through our travels over two days that covered only about half of the island’s shoreline, I counted almost 800 Great Black-backed Gulls. We spotted one with a turquoise wing-tag (tagged January 2012) and one with a green wing-tag (tagged May 2012), so the Black-backs on the island in March are probably a mixture of the winter and summer populations. No sign of the pink-tagged Herring Gulls. 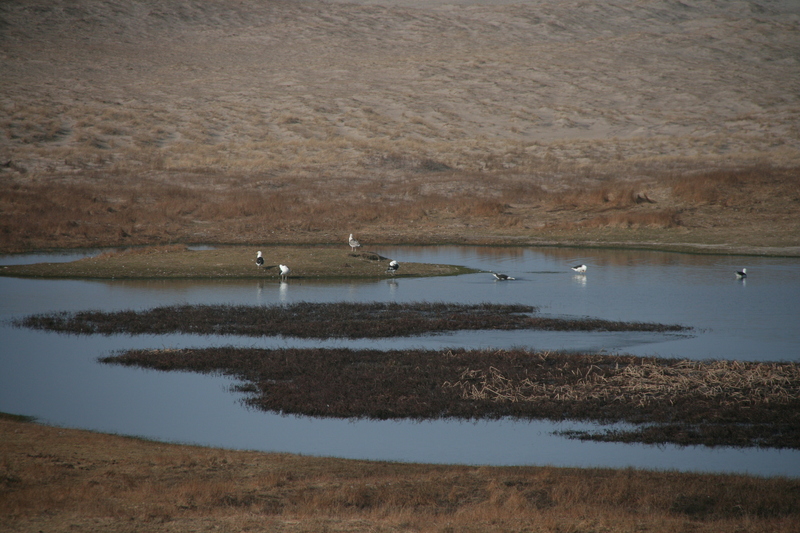 Great Black-backed Gulls gather around the freshwater ponds. This mound is a popular roosting and preening spot later in the summer. 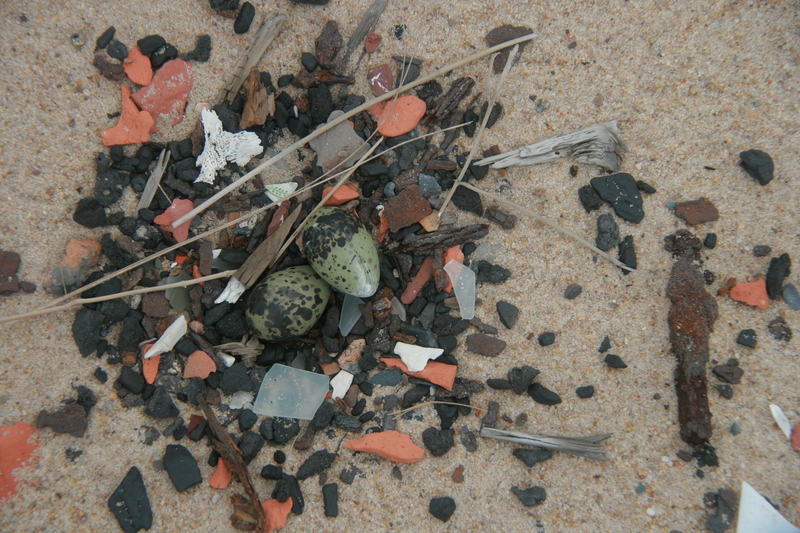 Late March brings the early signs of spring to Sable when the breeding Great Black-backed Gulls start to return for their nesting season in May. 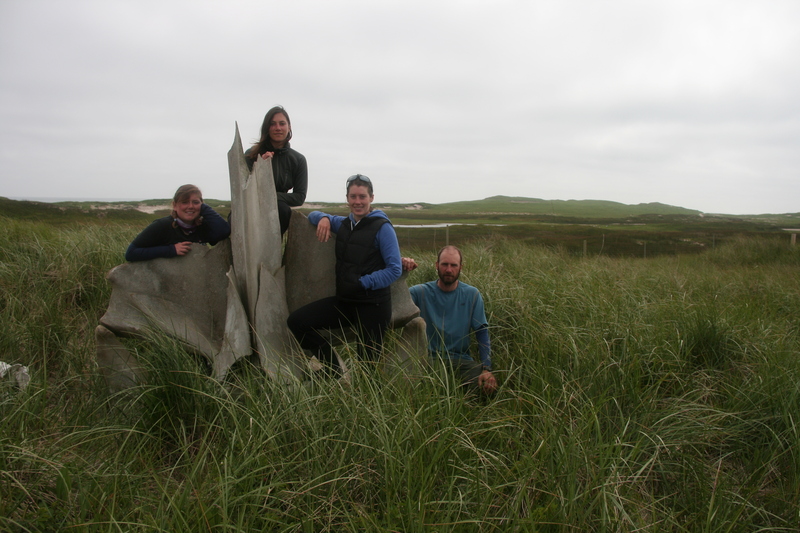 As I write this, me and our Acadia crew are anxiously awaiting our return to Sable so we can start our research again. Our flight has been delayed 5 days (and counting) due to the usual suspects of wind, rain, fog, low clouds, and a flooded runway. Gulls have it easy when it comes to getting off and on Sable Island. We wait. An Ipswich Sparrow perched on the top of a whale bone. 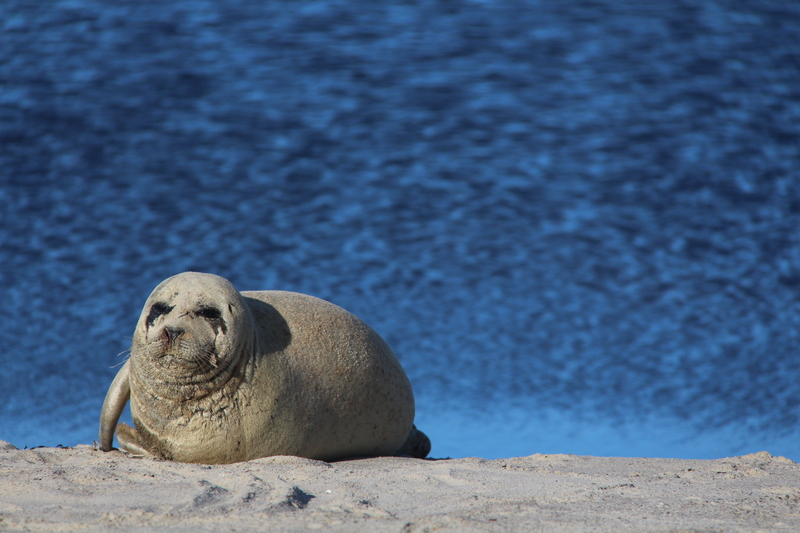 Ipswich usually migrate back to Sable Island in April but some spend the winter on the island. 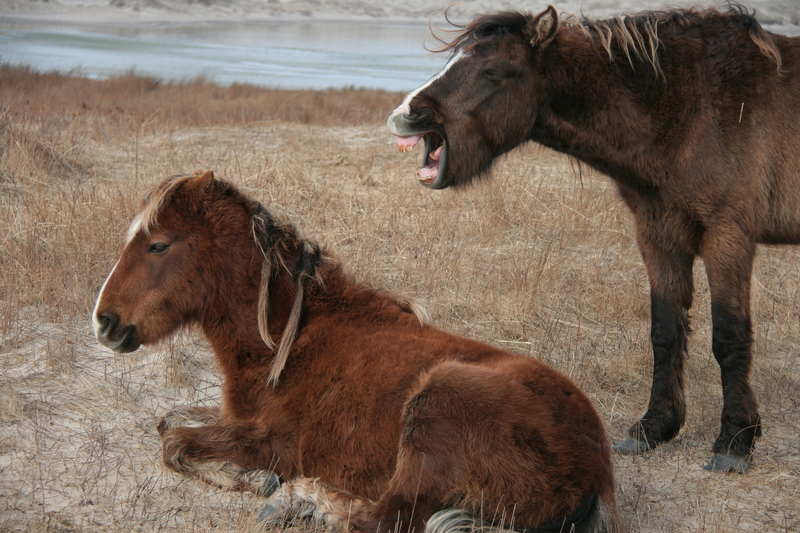 A horse yawns…maybe tired from the long winter. Recently I posted about the high number of Sable gulls that have been resighted in New York state this winter and last year. It looks like Massachusetts, and Cape Cod in particular, might be a contender for the “hotspot” of Sable gull sightings…or the wintering grounds of one individual at least. Herring Gull AFR has been spotted 3 times now in the Cape Cod area. First spotted November 1 at Herring Cove Beach near Provincetown. Herring Gull AFR on a beach near Provincetown, MA. Photo from John Kricher. Second sighting December 30 at the east end of the Cape Cod canal in Sandwich, MA, by local photographer Steve Arena On this same day Steve photographed two other colour banded Herring Gulls from different studies. One was a blue banded Herring Gull with letters “BBH” which was banded as chick last summer on a rooftop in downtown Portland, ME, in a study from the University of New England. 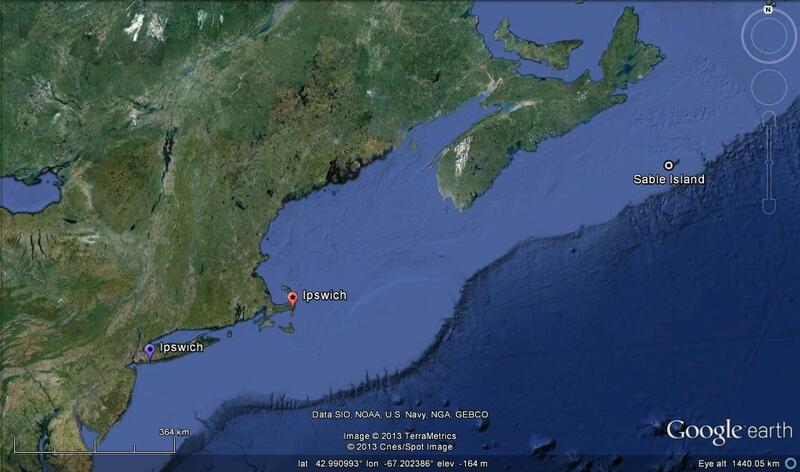 The other was green banded “M24” from a research program on Appledor Island also in Maine. Steve has some great pictures of other birds on his flickr site. Herring Gull AFR was later photographed by Steve Arena in Sandwich, MA, on December 30th. And again on February 27, AFR was spotted at the east end of the Cape Cod canal on a stormy day with 30+mph east winds and driving rain. Now a total of three sightings by three different people in three different months. I think it’s safe to say that Cape Cod is the wintering state of choice for Herring gull AFR. Thanks for all the reports and keep ’em coming. 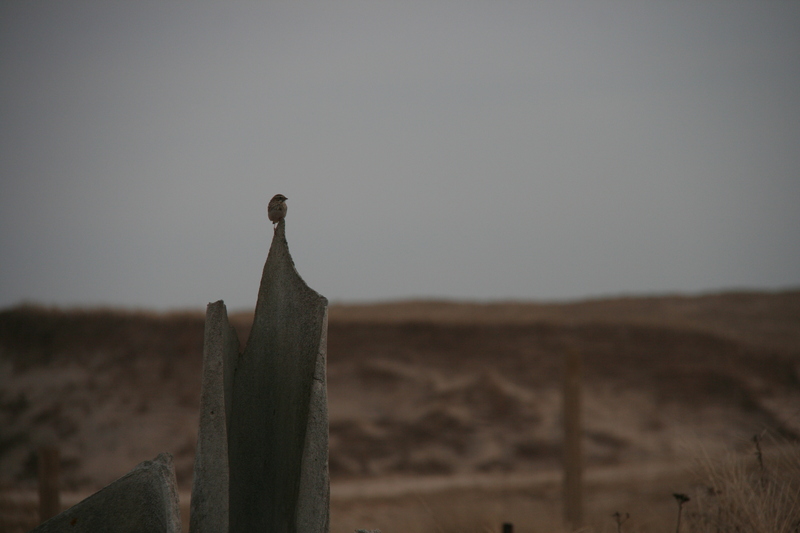 Sable Island birds seem to have a liking for New York (state that is). Last year Herring Gull AAF was spotted more than once in New York state before it moved a little further south to New Jersey for the winter. 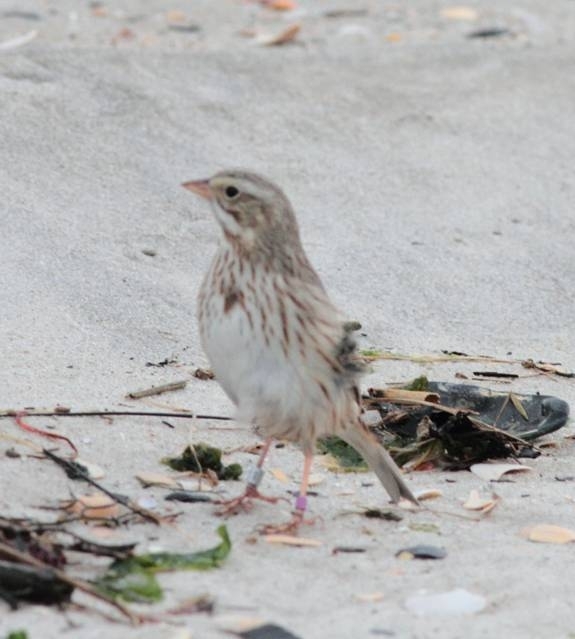 Last week we posted an entry about Ipswich Sparrows on the beaches of Long Island, NY. Now, on new year’s day 2013, Herring Gull AFX was spotted on the shorelines of Long Island, only 10 days before the Ipswich sighting. The bird was spotted and photographed by Angus Wilson who runs his own blog about birding on Long Island. Here is what Angus had to say about his encounter with a Sable Island Herring Gull. The location (Fort Pond Bay, Montauk) is a shallow, boulder strewn bay with a road running along the edge of the sandy beach providing access to a few houses and summer rental places. AFX was on the small lawn of an occupied house with some other Herring Gulls, hence my brief study. Perhaps the occupant put bread out? I usually check this beach when I’m in the area because it’s popular for loafing gulls, especially migrant Lesser Black-backed Gulls passing through in September and the occasional wintering individual. The peninsula (South Fork of Long Island) is very narrow at this point and gulls routinely shuttle over from the Atlantic Ocean side (<1 mile) to bathe in the freshwater of Fort Pond and loaf on the beach. I suspect most of these birds feed offshore or wait to intercept commercial fishing boats returning to nearby Montauk Harbor. AFX was spotted at the northern tip of Long Island, NY. Photo courtesy of Angus Wilson. Taken together, these sightings of Sable Island gulls in New York, New Jersey, Massachusetts, and Rhode Island are starting to give us a clear picture of the winter-range for this population. Thanks again to the keen gull watchers out there. A banded Ipswich Sparrow running along a beach on Long Island, NY, this January. Photo courtesy of Paul Gildersleeve. The Ipswich are on the move! 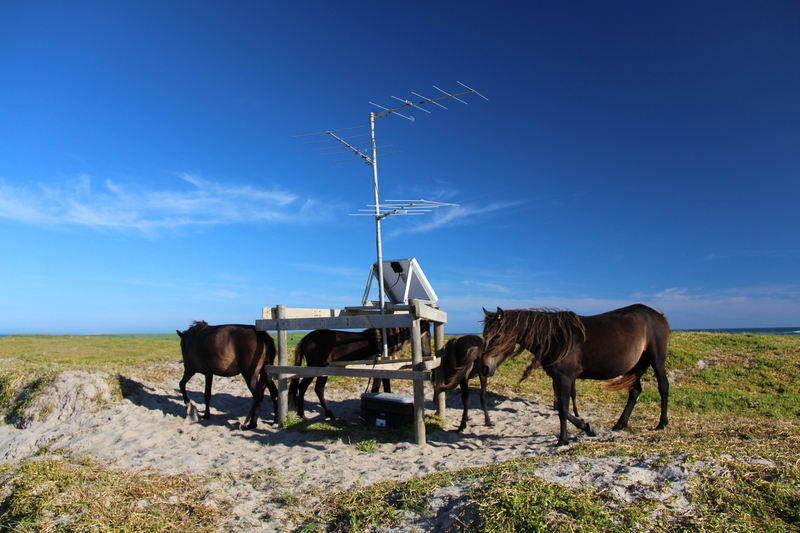 With successful banding and radio tagging completed on Sable Island in August, we have been eagerly watching as the results have been coming in. With our radio towers set up along the coast of Nova Scotia, we are hoping to learn more about their initial southward migration along the coast. Although most birds are now out of range of these towers, we still want to hear what the Ipswich are up to! Previous studies have shown that male and female Ipswich Sparrow’s winter separately, with males wintering as far north as Nova Scotia, and some females making it as far south as Florida. Any resightings of banded birds along their migratory route or on their wintering grounds will help us increase our knowledge of this species later in their migratory journey. They prefer sandy dune habitat along the coast and can be tricky to see foraging low on the ground. So far there have been 2 reported sightings of banded Ipswich Sparrows. Both were seen on January 11th 2013; one adult female on North Monomoy Island MA, 850 km from Sable Island, and a juvenile on Long Island NY, 1180 km from Sable. 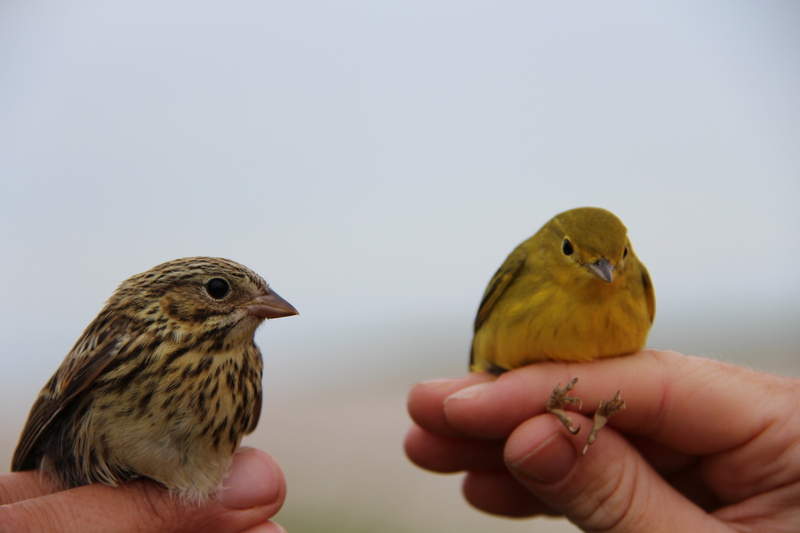 Both these birds were banded on Sable Island in the spring of 2012 and it’s very exciting to hear they made it safely down south for the winter. Thank you to those who have already reported color banded Ipswich, and please keep a lookout for any others and report sightings to Zoe at zcrysler@gmail.com. This purple banded Ipswich seen on Long Island, NY, was originally captured and banded as a nestling on Sable Island in early June 2012. Photo courtesy of Paul Gildersleeve. Red banded (adult female) and purple banded (juvenile) Ipswich Sparrows were spotted on their wintering grounds in the eastern USA. It’s time for a little game. Anyone who was a kid in the 1980’s would remember the “Where’s Waldo” books that tormented and delighted children (and maybe some adults) for hours on end. It involved tiny cartoons of hundreds of cats, rats, people, wizards and dragons crammed onto two-page spreads. Each page depicting a theme from pirates to sky scrapers or sea monsters to teddy bear picnics. Your quest was to find Waldo, in a red and white striped shirt, hidden among the crowds. Back in October I received a gull sighting report (and picture) that reminded me of a Where’s Waldo scene. 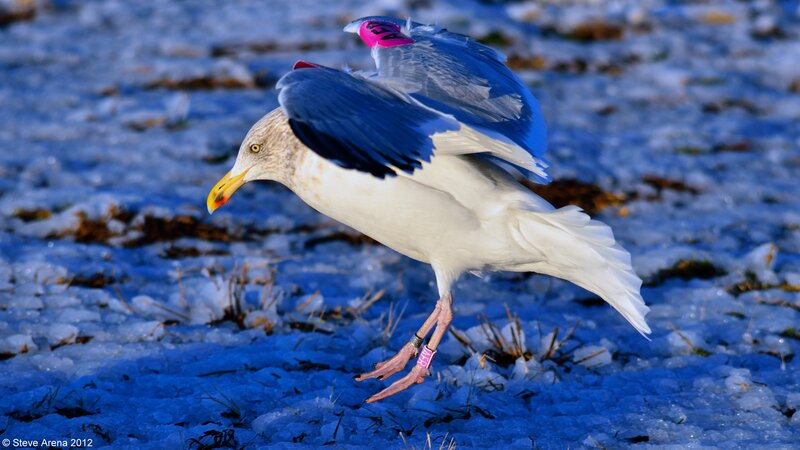 A Great Black-backed Gull wearing turquoise wing-tag AEE was spotted at a landfill site. Thanks to the picture from Rodney Gallant you can have a crack at picking out the tagged gull among the gulls and garbage of the East Prince Waste Management Facility in Wellington Centre, PEI. The wing-tags almost act as camouflage! So far I’ve found only one tagged gull in the photo but be sure to let me know if you find any more. 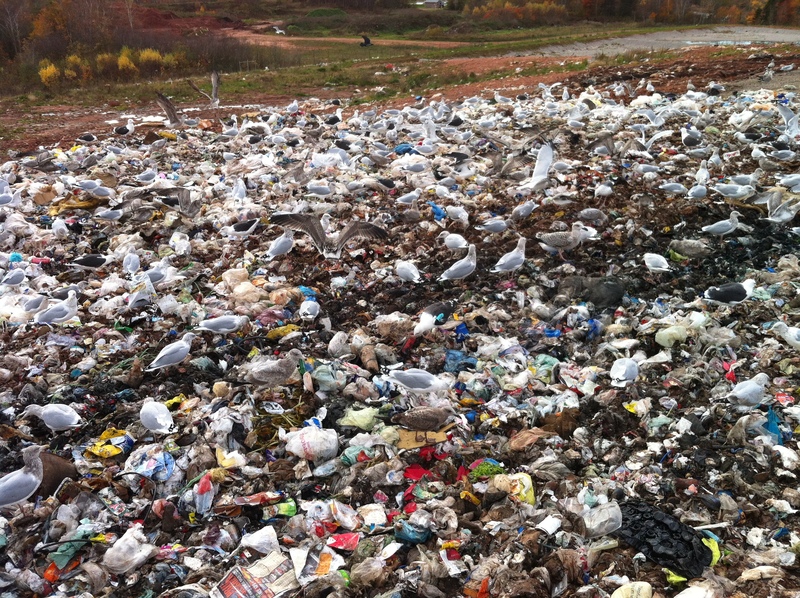 Spot the Sable Island Great Black-backed Gull among this mess of birds and trash. Hint: it’s wearing a turquoise wing-tag. Click on the image to zoom in for details. Thanks to East Prince Waste Management Facility for this photo!